Rasa2 is an responsive ecommerce / shopping theme that comes with support for the Hikashop component. Hikashop has proven itself to be a rock solid and reliable solution for your Joomla ecommerce needs. Rasa2 is a stunning and simple design that is flexible enough for you to use in a magaqzine, corporate, news or ecommerce based website. Rasa2 features extensive tools for controlling your website across various screen sizes. Choose from five different behaviours for responsive navigation, easy access to template breakpoints, built in support for php mobile detect and more. Rasa2 features an extensive list of theming tools to help tweak colours and layout variables used in the template. It's built in less compiler quickly and easily processes any changes. Bootstrap is not required for the Rasa2 template to operate with basic Joomla content views however if you need Bootstrap you can use our selective implementation tool to add the various required bootstrap elements to your design. It's easy to add your required bootstrap elements without adding the entire bootstrap library. Rasa2 also features a range of menu tools for creating dropdown, vertical, accordion and offcanvas menus. The Zenmenu plugin makes it possible to add icons, subtitles and multi-column menus to any core Joomla menu module. Rasa2 also offers the ability to connect your site to your social networks. Add social sharing for facebook, google plus, pinterest and twitter at the click of a button. 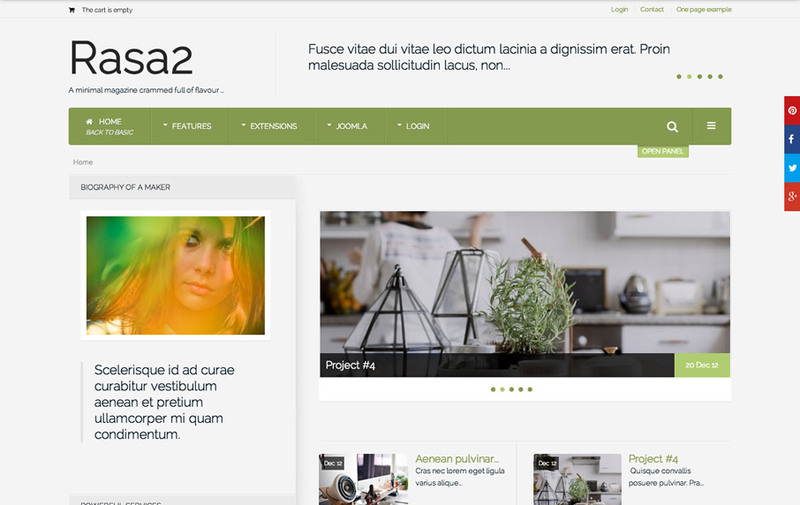 Rasa2 also features the ability to create a simple one page smooth scrolling design. One page make it possible to use your main navigation to scroll to specified anchor points on your page. One page mode works perfectly on mobile devices via the offcanvas or toggle menu options.